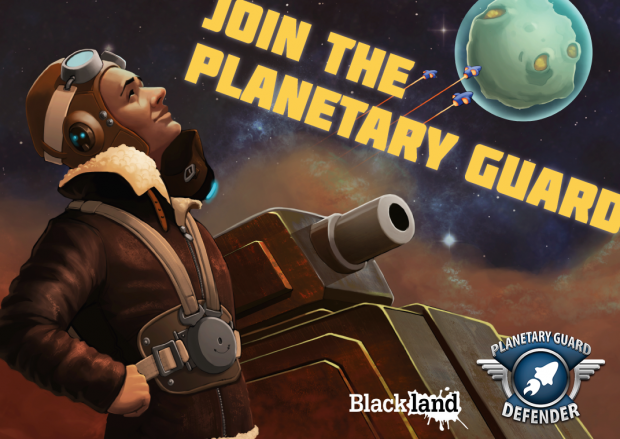 Planetary Guard: Defender is a shoot 'em up game with defensive game play features. Player can build turrets and minefields on force field of planets and operate a space tank against ever-growing hordes of enemies. In the distant future humankind has colonized several planets and even entire solar systems. After a unfortunate experiment to alter a primitive alien life form, humankind found itself locked in a bloody war with its own creation. Join the ranks of heroic Planetary Guard, the best militia in whole galaxy and defend planets against hordes of angry insectoids. Poster art painted for us by the very talented Frederic Daelemans.